Josh Eicchorn: more awesome than a monkey wearing a tuxedo made out of bacon riding a cyborg unicorn with a light saber for the horn on the tip of a space shuttle closing in on Mars while engulfed in flames. 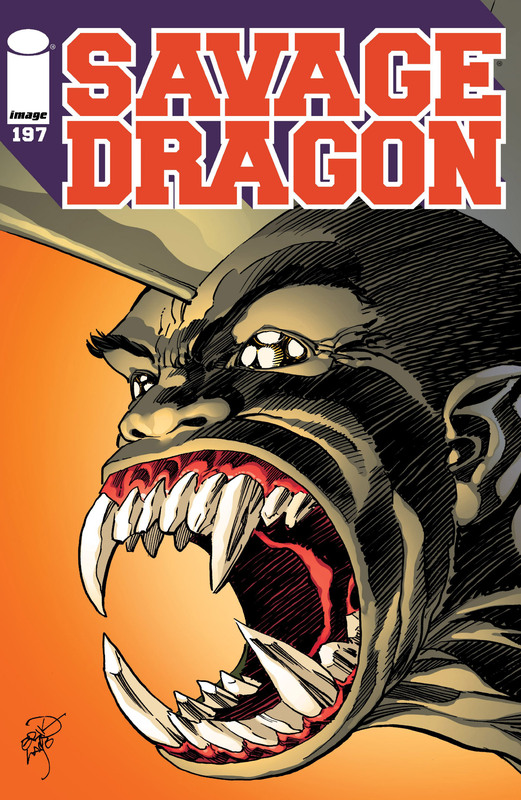 A cop named Doug attempts to order the mutated Malcolm Dragon to stand down but Frank Darling points out that he is not listening. Maxine Jung Lai then ignores pleas to stay away from the hero and approaches him. Frank hopes that Maxine’s presence may be just the thing to calm Malcolm down. Maxine walks over to her motionless estranged boyfriend and is watched from a distance by Samurai. The villainess makes a call to Dart and updates her on the current situation and awaits further instructions. Maxine desperately tries to get through to Malcolm who is suddenly distracted by a noise. She turns to face the source of this sound, the arriving reinforcements of the Vicious Circle. The villains dogpile onto Malcolm who is still wielding the giant rock attached to his leg via chain. This weapon is used in brutal fashion. It first scatters the attackers before then crushing in the skull of Devastator. Victorious blasts off Malcolm’s leg which frees him from his manacle. The rock then tears apart both War-Cry and Caveman until finally it is then used to squash both MegaTech and Victorious. Malcolm’s lost leg rapidly regrows due to his transformation having amplified his healing factor. This carnage had been witnessed by Zelda Frip and her boyfriend, Parker. They had been discussing receiving the cure to their mutations. Parker is fearful that he would lose his girlfriend as she will become beautiful once again whereas he was never an attractive person. Zelda pleads with Malcolm to head over to Bellco Chemicals to get the Freak Out cure. Maxine is unable to convince her boyfriend to stay as he leaps off to perform his assigned task. any but also reveals that Warrior was crippled and may never walk again. Samurai and Insect avoided serious injury but everyone else that survived are barely injured and in police custody. Dart is furious with this update and decapitates Fusion with her God Sword out of impulsive frustration. She then notes that if she wants something done then she will simply have to do it herself. At the police precinct, Maxine talks with the cops and is upset that Malcolm did not seem to recognize her. Meanwhile, Captain Stewart interviews Zelda about the situation and is informed that Herringbone Seed was behind the scheme to mutate Malcolm and use him to destroy Bellco. Stewart fears that the affair will not end well as Malcolm seems to be out of control and is now going on a rampage. alcolm then picks up the Freak Out guns and prepares to head back into the Danger Zone to cure anyone there that desires it. Dart suddenly bursts out from the shadows and slices off both of Malcolm’s hands before getting kicked back. The cops move into action but Dart kills most of them with her exploding darts before moving to finish off her prey. She is struck from behind by Malcolm who head-butts her unconscious before passing out from blood loss. Malcolm later awakens in Hillman Hospital where Larry Bradford informs him that he is out of danger thanks to a blood transfusion. The Freak Out had removed all of Malcolm’s mutant powers inherited from his mother along with his healing factor. Larry notes that as they did not have any of Malcolm’s own blood that they had to use some of his father’s old blood. His healing factor has been restored but the lightning abilities are likely gone forever. He is then advised to start giving blood donations to the hospital to treat further injuries. After Larry leaves, a now human Zelda enters to visit with Malcolm. She thanks him for all of his help and explains that Captain Stewart took the Freak Out to the Danger Zone to cure everyone. He then put all the blame onto Herringbone Seed so that all of his accomplices can go free and start their lives again now that they have been cured. Bellco has blamed the tainted water on a disgruntled ex-employee and agreed to clean up the whole situation. Zelda departs with a similarly cured Parker. Maxine then comes to see Malcolm and the couple are reunited properly. A number of skull ships and two other vessels arrive over Kalyptus, heralding the return of Vanguard to his home planet. Wally cannot detect any life signals on either the planet below or in any of the floating cities in orbit. They are being repeatedly scanned by the Mekka-Drones in the cities but cannot see any of them. 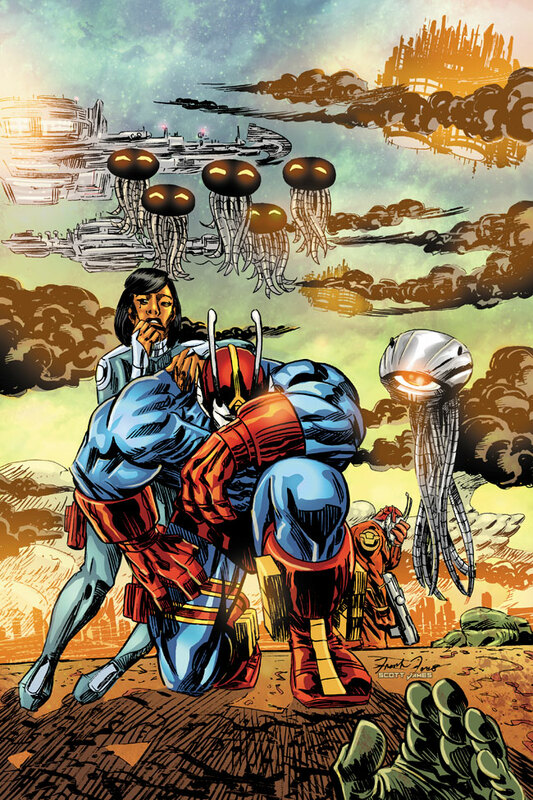 Vanguard, Wally and Roxanne Wells teleport down to the planet to investigate. They survey the carnage that was the Krylan massacre at the hands of the Tyrraneans but are shocked to see that the murderous aliens all appear to be dead too. Galian and Lurch are summoned down to the planet’s surface to assist in looking for some answers to what has happened. Galian detects that a poison has permeated the very planet but cannot tell where it originated from. Lurch to make contact with one of the dead Krylans to take on his form, accessing his memories. The extermination of his race is recalled and that the poison that once eradicated the Tyrraneans was unleashed once more to kill them all too. The dead man notices his own corpse and begins to freak out, prompting Lurch to resume his own form quickly.